Gyor is the capital of Győr-Moson-Sopron county and Western Transdanubia region and located in the northwest of Hungary. The city has about 130,000 inhabitants, making it the sixth biggest city in the country. 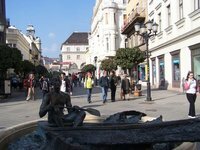 We have a comprehensive list of accommodation in Gyor searchable right here on Travellerspoint. You can use our map to quickly compare budget, mid-range or top of the range accommodation in Gyor and areas nearby.